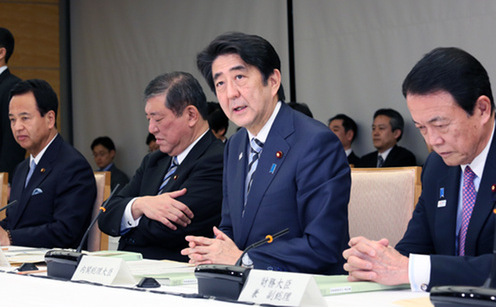 Prime Minister Abe Shinzo presiding over the special economic zones advisory commission on 3 March 2015. Image courtesy the Prime Minister's Residence. If Abe Shinzo is looking for reassurance on the public's continued confidence in his leadership (I would suspect that after December's romp in the House of Representatives election he might not) then yesterday's release of the results of NHK's weekend polling results would leave him feeling bereft. Down and up 8% represent major movements in both numbers. These big moves in public sentiment may be one offs, reflecting public disgust with "money and politics" scandals seared into recent memory by the resignation last month of Agriculture, Forestry and Fisheries Minister Nishikawa. Sadly most of the attention of Nagata-cho residents seems to have already moved from campaign finance scandal to Shukan Shincho's photos of Nakagawa Shoi'ichi's widow Yuko (Hokkaido #11 and currently Parliamentary Vice Minister for Agriculture, Forestry and Fisheries) on-the-street snogging with the younger and married Kado Hirofumi (Kinki proportional - no jokes here please). It's the scandal du jour. Well, it was actually du soir -- indeed the very night that Nishikawa turned in his resignation...but I digress. More likely, however, the numbers reflect a return to reality for the Abe administration. Looking back, they are not very different from the support/do not support numbers of the Abe government in July of last year, before the Cabinet reshuffle and November, before the calling of a snap election. In between, the Cabinet's numbers have been goosed upward by positive feelings about the large number of women appointed to the Cabinet in the reshuffle and by what was likely a mild "rally round the flag" effect as a result of the hostage crisis. Just what Prime Minister can do now to bump up his Cabinet's numbers is anyone's guess. Later - NHK's surprisingly low numbers put Abe back in a race again, between himself and bad news. The outlook is largely positive for him in the short run, if negative for the country. Beyond the June end of the Diet session (a question mark there - committee work is so behind schedule most folks in the know say the session will be extended well into July) the outlook for the PM is not so sanguine. Abe and his appointees have pulled every economic lever: extreme quantitative easing, fiscal profligacy and shifting the nation's pension assets from Japan government bonds to Japanese equities. The Bank of Japan under Abe-selected Kuroda Haruhiko has gummed up the JGB market so thoroughly that the prices of bonds no longer contain any information. The GPIF and the Post Office are doing their dangest to achieve a similar result in equities markets. Soon, if not already, the price of a share in a listed Japanese company will say nothing about the capital stock, labor force, management, technology or special advantages of that company. Instead the price will only reflect only what government and government-linked investment behemoths are willing to pay for the shares, right now. Despite the Abe government's every effort to game the system, the public has not responded. Neither the puffed up indicators of a coming prosperity nor the government's promises are reassuring. The voters currently does not have much of a choice as to alternate visions keeping Japan a player on the world stage. However, unless the economy turns, the stagnation-despite-steroids will set the eyes of the electorate to searching for another leader.